Simple 4 ingredient Banana Mocha Smoothie. Chocolate mocha iced coffee blended with banana, cocoa powder and cocoa nibs. A sweet breakfast treat! Iced coffee is a daily habit of mine. One that brings the benefit of an energy boost as well as the satisfying experience of drinking it. There’s something about iced coffee that’s so refreshing. I’m a bit obsessed and enjoy it year round, even in winter. Since it’s summer, iced coffee is even better for an everyday drink. 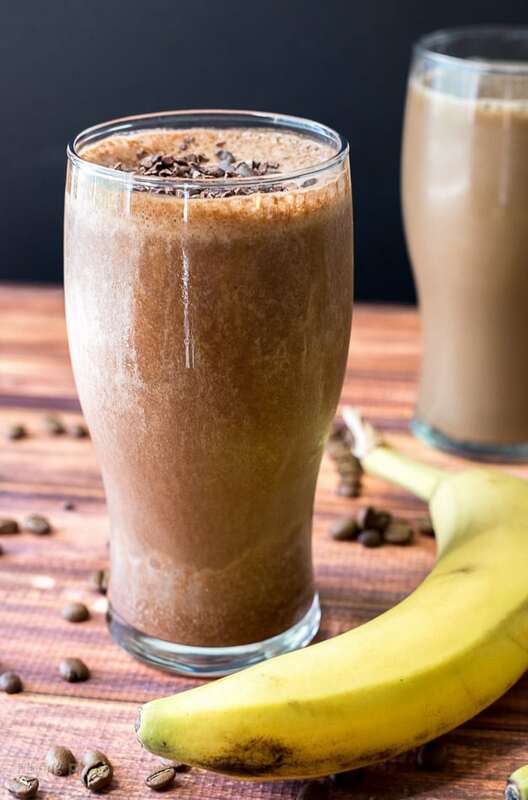 If you want something with iced coffee that’s a bit of a treat then look no further than this Banana Mocha Smoothie. Fruit and veggie smoothies are a regular part of my eating routine, but after this mocha smoothie, I may have a new addition to the routine. To make the Banana Mocha Smoothie, start with iced coffee. Flavored store-bought is best as it’s already sweetened. Add a bit of cocoa powder to boost the chocolate flavor even more. For that perfect thick and creamy smoothie texture, use a frozen banana. No ice is needed which means no watering down. Blend then stir in cocoa nibs for a lovely crunch and rich chocolate flavor throughout. Flavor profiles: Rich coffee and chocolate, sweetened with banana. Texture: Thick, smooth and creamy. 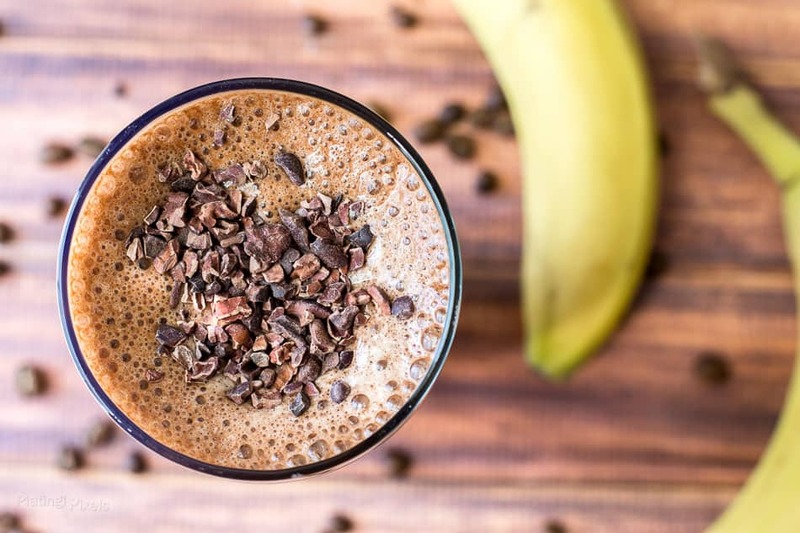 Simple 4 ingredient Banana Mocha Smoothie. 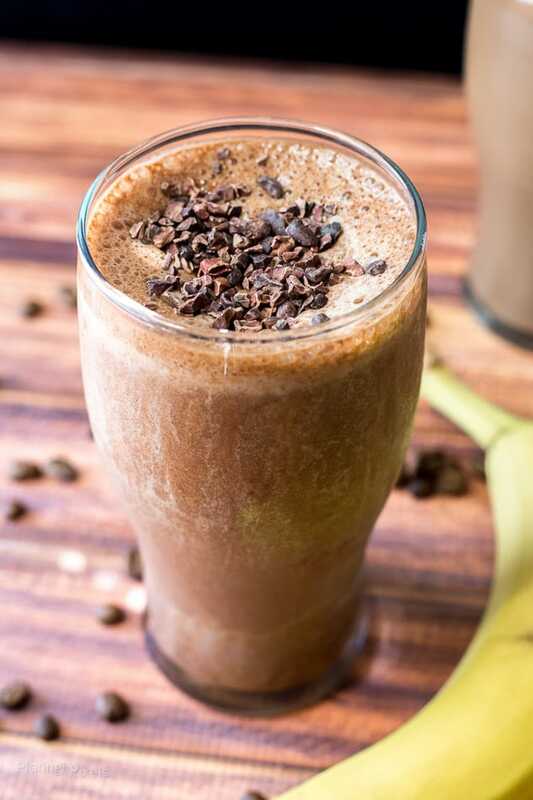 Sweetened iced coffee blended with banana, cocoa powder and cocoa nibs. Place frozen banana, iced coffee and cocoa powder in blender. Blend until smooth. Top with cocoa nibs and lightly stir in before serving. 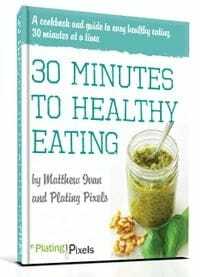 Keep banana chunks in the freezer to make this recipe quick and easy to make any time. Mixture should be thick. Add more banana or iced coffee to reach desired thickness. I could totally make it a daily habit too Carolyn!